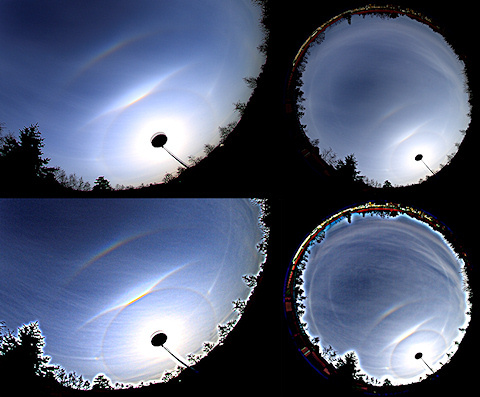 Long absence of rare high cloud halos in Tampere skies was brought to a sudden end by a complex display on 2 May 2008. Singly and Parry oriented columns played the key roles: among the more common halo forms the display featured an upper suncave Parry arc and Wegener arcs. Sun elevation was ca. 27 degrees. Both photos are stacked images (no longer than 5 minutes' time period for each). Below them contrast enhanced versions are provided. Also, larger images are available online ( 1 ). Some thirty or so kilometers south of my point of observation Immo Ruonala also observed this display. Notably he observed an anthelion as well as 120 degree parhelia. As it is, we still do not know how anthelion is formed. One theory is that it is but a brightening in the crossroads of anthelic arcs, whereas some people maintain that it is a distinct and independent halo form, perhaps explained by anomalous crystals and / or an exotic orientation. It seems that anthelions can appear regardless of the intensities of, say, Wegener arcs. On the other hand, bright 120 degree parhelia are often observed in conjunction with anthelions, but even these are not always present. Regardless of how anthelions originate one thing is certain - there are still some white areas in the overall map of halo theory. By the way, I am envious of your all sky capability.